A box of French Gracelings appeared on my doorstep on Friday, so either it's out now in France or it will be soon. yAt! Also, I'm thrilled to announce that I have a deal with Ediposs Publishing House to publish Graceling in both Czech and Slovak. Double yAt! Next, I'd just like to say that I'm way behind in EVERYTHING, especially everything email- and blog-related. I had hopes of finalizing my FAQ pages this weekend and putting them up for you all, but I failed on that count. I hope to put the FAQs pages up soon (maybe next weekend? ), and when I do, they should answer a lot of the questions I've gotten in comments and on email lately. Finally, like the t-shirt I got in New York? I got it (and a delicious cupcake) at the Magnolia Bakery. And I got my photography degree at The University of How-to-Take-Terrible-Self-Portraits-in-Which-Your-Head-Looks-Eerily-Large. Pics from Bologna coming soon! :p Awesome....Where is the failure part though? I love cupcake and you've just made me extremely hungry....Might I suggest the Vampire Kisses series by Ellen Schreiber...It's cutsy and teeny-bopper-ish but it really is an amazing series. I'm waiting for the Bologna pics and a scary blonde just walked into my mom's office:-O I think(No offense to the british or blonde's since I myself have light colored hair) that when I go home to Detroit I'll hug every person with an american accent and who says mom and not mum! I am SERIOUSLY coveting that T shirt. 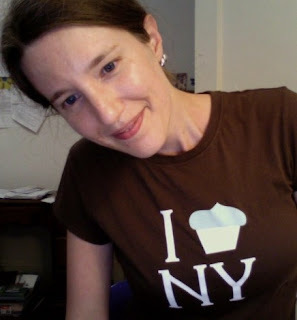 So, love the t-shirt, envying the cupcake that came with it (and is surely gone by now) congrats on the publishing deal, and don't worry about being behind, it builds suspense! I have a friend who has the most amazing, huge brown doe eyes. She's always taking these pictures of herself wherein she leans towards the camera and looks up through her lashes, which makes her eyes look impossibly luscious. i have to do another "i hate the weather in michigan" comment cause i just got back from tennessee and it was soooooooooooooooooo beautiful!!!!! and warm!!!!!!! and when i got back it was 30 degrees!!!!!!! and there might be snow!!!!!!!!! help me!!!!!!!!! I love photography and can usually take good photos...of everything but me. I do not photograph well. Especially if I try to do it myself. At least you got all of you in there! Cupcakes are sooooo good. I work Saturdays at a local bakery. They have a 2nd location called "The Cupcake Corner" that is downtown. So, I get to make these huge delicious cupcakes all the time. It is so hard not to take some home. One of the best inventions ever has to be the peanut butter buttercream frosting. I can eat it by itself. Mmmm. Now I want some! And don't be so hard on yourself for not getting email/blog stuff done. You just came back from a long trip! By the way, did you hear about the earthquakes in Italy? Yikes! I was wondering when the second book will be in the bookstores...Are you writing it? Also, do you know if you are coming to spain? Thank a lot, please, continue writing! No failure - only progress. You'll get there Ms. Kristin. Aw, you're all so nice -- I feel like that lady in Alice in Wonderland who's running and running and getting nowhere -- the Queen of Hearts? Spades??? Who was that lady? And you also all crack me up. Ha! Bathtub faucet reflections, nice. And cheese on my nose :o). Snow in April -- not so nice! Alissa, I second Angie -- peanut butter buttercream frosting?!?!? Oh, that sounds divine! Kuri, thanks for writing from Spain! The second book is written and will be out in English in the fall, but I'm not sure when the Spanish are publishing it. I'm often out of the loop when it comes to the foreign editions. I'm also not sure if I'll be coming to Spain, but we are batting around the idea of a European tour next fall, so it's possible -- I'll keep you posted! Finally, the Italian earthquake is terrible news -- my heart goes out to everyone there. One night (morning) me and my boyfriend decided we wanted cupcakes and went to walmart where we got cupcakes fresh from the over. We take them home, start eating, only to discover that there was a pocket of frosting in the middle. They were the BEST CUPCAKES EVAR! And we never saw those cupcakes again. Everytime we go to Walmart we ask and they deny everything! That one magical cupcake night will live on! 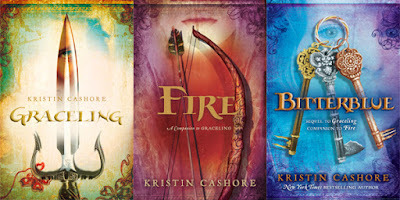 Did you see Graceling is in the Battle of the (Kids') Books? I need to go read The Underneath to see what you're up against! I love the books they picked, it's going to be fun to see who wins each round. Good Luck!! When the second book will be in stores? Jen, I did NOT know about the battle -- thanks for alerting me! Lily, thanks for writing in from PR! No immediate plans to go there, but I'll keep you posted on any touring plans! I think this is a happy variation of "I8NY" - hope it was tasty!